Beautifully illustrated (and quite heavy) book. Not a light read either. It is a rarity among art books in that it focuses primarily in the habits, techniques and studio inner workings of a famous artist instead of the usual historical or symbolic context of the art. This book is exhaustively thorough in its research of studio practices, apprenticeships, preliminary works on tablet, supports, palette, binding materials and painterly technique of Dutch art in the Seventeenth Century in general and Rembrandt in particular without omitting possible influences and comparisons. The book seems mostly aimed at restoration experts even though the chemistry and scientific lingo is reduced to a minimum with some serious omissions like the chemical nature of Rembrandt's pigments for example which are mostly mentioned by their common name and period nomenclature but rarely reduced to their chemical origin. A working painter will surely find the chapters on binding, imprimatura and color palette very interesting as well as the evolution of Rembrandt's style from a tight style in stages to a "pittura macchiatta" influenced possibly by Titian or a byproduct of the artists' lengthy experience. 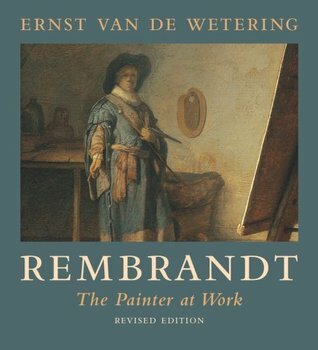 I think the last 4 or 5 chapters should be required reading for anybody that is a Rembrandt admirer. I found that the information about the size of a palette and how colors had to be mixed by assistants to tackle specific passages for the day really enhanced my understanding of what amount of planning and expense was required back in the time. 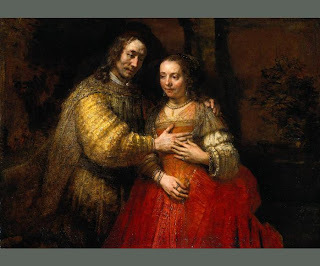 It also made me understand better the reduction to tone and brush mastery , the unity and volume of Rembrandt's technique as he became older and more parsimonious. The main "thesis" of the book in my opinion is debunking the merely visual attempts made by many to elucidate the alchemy behind Rembrandt's mysterious technique. Starting with painter Josefz Israelis muddled interpretation of the master's beautiful palette and "houding" = (I understood this to mean a masterful unity in color and composition , what makes a painting come together form a distance).Israelis work just looks muddy, not particularly compelling in my opinion. The underlying quality of Rembrandt's art owes a lot more to a clear understanding of light distribution than Israelis was willing or able to aknowledge. Other students of Rembrandt's masterpieces include Reynolds (who attributed the lusciousness of Rembrandt's art to an abundant use of wax), a Jacques Maroger who claimed to have come close to the mysterious binding medium ( a mix of mastic, wax, lead, turpentine and other substances) and Max Doerner's, whose thesis regarding the use of glazing and resins seems to be misoriented. as proven by years of mismanaged restorations that failed to remove the color that should have been in the thin upper glazes. "The Jewish Bride " 1667 (Rijksmuseum, Amsterdam) is one of the most analyzed paintings in the book. Through the use chromatography the author finds nothing but linseed oil, walnut oil and traces of egg emulsion ! in the artwork. . Moreover, through analysis of unfinished works, etchings and X-rays, the author also deduces that much of Rembrandt's work was a lot more direct than initially thought with sketching done directly in oils and local color applied fairly early on. In many ways, Rembrandt and his contemporaries owe a lot to Van Eyck, an earlier master whose breathtaking technique (like emulating textural qualities of materials through relief in the paint and light capturing volume) and splendor were probably the direct antecedent to many in the Netherlands. I did appreciate this fabulous book despite the difficult reading and I'm sure new discoveries will come forward in time. I just wish there was a more abbreviated and lighter version and that more attention had been paid to link older and current pigments. Some nice paintings at the Huntington.